The pomegranate is native to India and has been cultivated in South Asia, Middle East and Mediterranean region since ancient times. The Scientific name of pomegranate is Punica granatum in the family Lythraceae. It grows best in tropical or warm and temperate climates, although they are extremely cold tolerant down to 10 degrees. It is hardy in USDA hardiness zones 7 through 11. It can grow in regions with cool winters and dry hot summers. The pomegranate is well suited to the climate of south-western Australia. Continue reading below to know detailed pomegranate growing tips and other information including how to take care for pomegranate including pollination, fruit harvest, pruning, fertilization and reason for fruit splitting. The pomegranate is a deciduous shrub growing 5 to 10 m (16 to 33 ft) tall and up to 4.5 m (15 ft) wide. 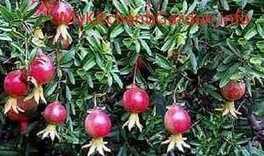 The dwarf pomegranate variety grows to 1 m (3.2 ft) high, and can be grown in pots, even indoors. Once established, the pomegranate tree can live for many years, over 200 years, producing fruits in the first 10-15 years only. The pomegranate glossy leaves are narrow oblong, 3–7 cm (1.2–2.8 in) long and 2 cm broad. The foliage changes color from red to apple green with the seasons. The flowers are 3 cm in diameter with flaming orange-red color. It produces large red or orange fruit. Pomegranate is a good source of vitamins A, C and E, iron and other antioxidants and fiber. The pomegranate peel contains three times more antioxidant properties than its pulp. Pomegranate has many health benefits in heart disease, high blood pressure, inflammation and some cancers, including prostate cancer. Keeping pomegranate's dried peels in mouth and sucking its juice can help relieve dry couph. How To Care For Pomegranates? The pomegranate can be grown from seeds, seedlings and cuttings (how to grow pomegranate from cuttings). Plant the seedling or sow seed or seedling in full sun. The pomegranate grows best in well drained nutrition rich soil of pH 5.5 to 7.0. Mix cow manure, compost, river sand in the garden soil or potting mix. The pomegranate seedling can be planted at any time of the year. If you wish to grow pomegranate from seeds, you may sow seeds indoors in mid winter. The seedlings will be ready for planting by spring. Scoop out some seeds, remove their pulp and wash them in water. Sow directly in soil or enclose in a wet paper towel and put inside a zip-lock bag and keep in shade. Dry the seeds and refrigerate for about a few weeks. Sow the seeds about ½ to 1 inch deep. The seeds will germinate in a few weeks, which can then be planted in soil. Seeds sown in soil will germinate in about a month. Cover the soil with an aluminium foil to raise the soil temperature to speed up sprouting. Dry the seeds for a few days for storing. Whether you have grown pomegranate seedling from a seed or by rooting a cutting (How to grow pomegranate from cutting) Plant the seedling in the pot or ground at the same depth level it was planted in the seedling pot. Do not plant your trees too deeply. The pomegranate root system is less than 60 cm (2 ft) deep, however, it can be 90 cm (3 ft) for very large mature trees. So the pot should be at least 60 cm deep. To grow pomegranate tree in a pot, you will need at least 50 liter (13 gallon) size container, the larger the better. The pot can be moved indoors during extreme cold and frost. Mulch the plant with a 3 inch layer of sugar cane mulch. This will hold moisture in the soil. Prolonged water restriction can cause leaves to fall prematurely. Water frequently during growing, flowering and fruiting time. However, water the plants less during the winter months when the plant become dormant. Irregular watering may cause many problems. If the watering is not regular and even during fruit development, will cause the fruits to split. Avoid too much water, just water until the soil below the mulch becomes wet. Too much water can encourage development of fruit-splitting fungus. The pomegranate flowers are self-pollinating - means, the tree has both male and flowers. So only one tree is needed to set fruit. The male flowers are small bell shaped, while the female flowers are vase shaped (See the picture of flowers). The male flower drop without fruit setting. If you have a tree which produces flowers but no fruits, the most common reason is the lack of pollination due to less bee activity in your area. You can pollinate the flowers by using an artist paint brush to transfer the pollen from the male stamen to the female ovary. Inadequate sunlight may also cause the lack of fruit production. Protect your pomegranate tree from too cold temperatures to avoid dropping of flowers. The pomegranate trees generally start bearing fruit from the second or third year. The pomegranate tree fruits during March to May in Southern Hemisphere and from September to February in Northern Hemisphere . Once the fruit is formed, it takes 6-7 months to mature. Fruit fly traps can be put near the tree. The fruit is ready to harvest in autumn to winter. Pick the biggest and the brightest fruits first. The ripe pomegranates can be stored in a dark, cool place or the fridge for a couple of months. How to know when a pomegranate is ripe and ready to be picked? Note that the pomegranates do not ripen after you pick them unlike other fruits such as banana, mango and guava. The overripe pomegranates will split open on the tree. So pick the pomegranate fruit at the correct ripeness. The pomegranate is ripe and ready to eat if it has grown to its full size and the skin becomes firm and heavy. The color may be an indicator for its ripeness. The skin of the ripe fruit becomes red or deep red, however, the color varies from cultivars to cultivars. When you open a pomegranate, you will find bright red seeds with white or brownish pith on opening a good ripen pomegranate. But if the seeds appear brownish and soft, that means it is bad and not good for use. Irregular and uneven watering as mentioned above. Fungal disease at the time of fruit ripening can split the fruits. Fungal diseases can cause leaf spots, flower drop, premature leaf drop, fruit splitting and fruit rot. Spray copper fungicide when the fruits begin to grow. Insects like aphids, whiteflies, mealybugs and scale will cause of curling pomegranate leaves. To control insects on tree, spray the tree with neem oil. Do not fertilize pomegranate tree during the first year. Apply a thck layer of compost or aged manure as mulch. You can feed plant with compost tea or a liquid fertilizer every 3 weeks. Too much fertilization can lead to excessive leaf growth and premature fruit drops. A fertilizer of N:P:K (nitrogen, phosphorus and potassium) 10:10:10 is good for pomegranate trees. A deficiency of calcium, ammonium or magnesium may cause the leaf tips to turn brown and curl into a hook shape. When your your pomegranate tree is about 3 feet tall, trim its branches by about a third to encourage new growh. Regular pruning of the pomegranate tree will ensure good harvest. Prune out suckers growing at the base and inward branches at the middle to prevent over-crowding. While pruning note that the pomegranates flower on new growth and bear fruit on branches that are 2 or 3 years old. To keep fruiting wood coming, each year remove suckers, dead wood and some of the oldest stems to stimulate new growth. Prune only lightly, heavy pruning reduces fruits. Winter or early spring is the best time for pomegranate tree pruning before the start of new growth. The pulp of ripe pomegranate is eaten along with its seeds, and also used as its juice juice, smoothie, in baking, cooking, garnishing and alcoholic beverages. 1. A Morphological and Histological Characterization of Bisexual and Male Flower Types in Pomegranate, Hazel Y. Wetzstein, Nadav Ravid and Erik Wilkins and Adriana Pinheiro Martinelli, Journal of the American Society for Horticultural Science, Vol. 136 no. 2, 83-92, March 2011.